President Obama awards the Medal of Honor to former Marine Sgt. 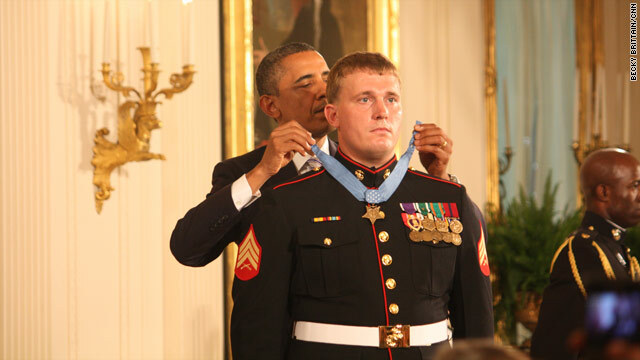 Dakota Meyer for conspicuous gallantry and intrepidity at the risk of his life above and beyond the call of duty. The ceremony was held in the East Room of the White House on Thursday. After examine a number of of the weblog posts in your website now, and I really like your way of blogging. I bookmarked it to my bookmark website listing and will probably be checking again soon. Pls try my web site as well and let me know what you think. Hello there, You have done an incredible job. I will definitely digg it and personally recommend to my friends. I'm confident they will be benefited from this website.